Modified from Public Domain Wikimedia Commons image http://commons.wikimedia.org/wiki/File:Empalement.jpg; Facebook logo? Sue me. The real question is– can one really kill the Beast? 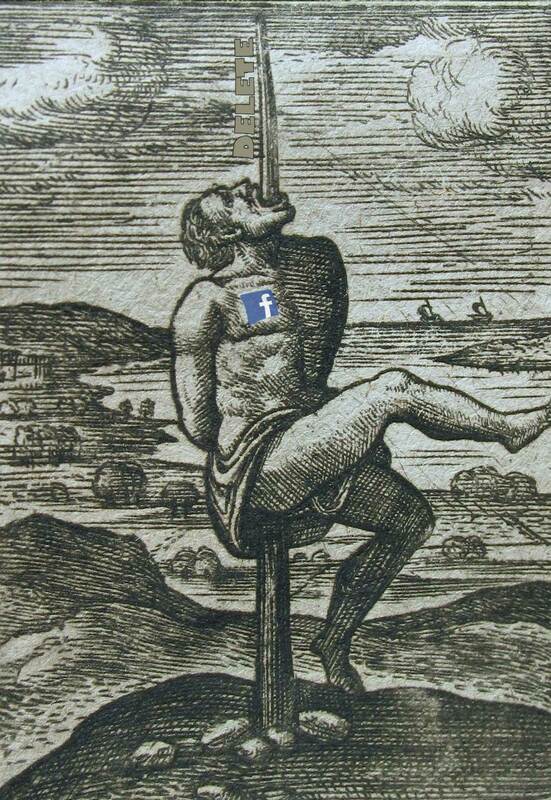 This is not a reaction to the uproar over the Facebook leaked “research”. I kind of feel that if you can have your emotions manipulated by a Facebook timeline, you have much bigger issues to deal with. I’ve flipped them the bird for being stingy with media. I’ve growled about their literal sucking of your data. I’ve done what I could to neutralize it’s reach. I’ve tried to torque it’s methods by Liking Everything. Then I tried Liking Nothing. When it comes down to to it, weighing what I get out of Facebook (over the last year, I found myself doing more flipping through the feeds, to get a sense about what other people post) versus what I do…. well the latter was poor. I did get to see more info from some cousins than I normally would. I had some fun leaving snarky comments. I did start a group for the diabetic summer camp I attended as a kid, and saw that grow to over 200 people, and briefly rekindled some connections. My original intent for joining was to understand it more. I think I have that accomplished. 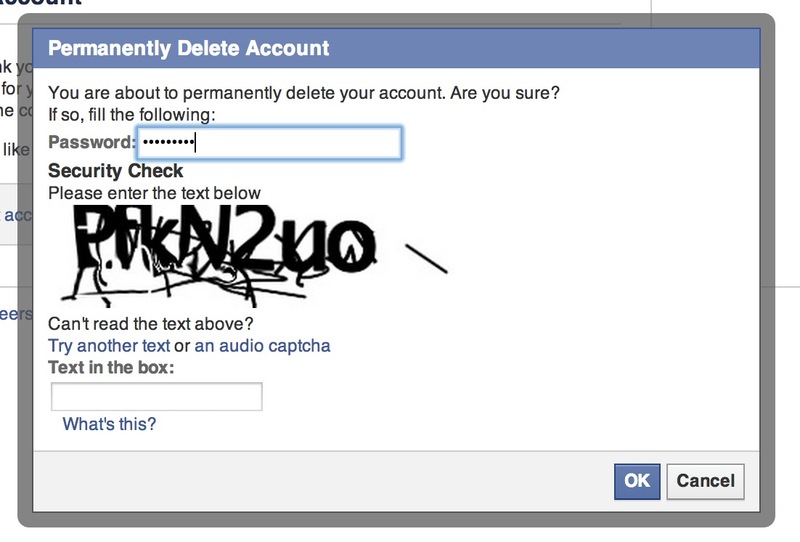 There was a time when I was at NMC that I need an account to authenticate some site against. No need for that. I find the amount of connectivity broad but really shallow, infrequent. When I leave a comment on someone’s status, I get piles of notifications that other people that I do not know wrote something in the same thread. I find that not very useful because most of the time, I do not know them and what they write has little relevance to mine. So tonight, while at dinner here at the hotel in Tucson where I speak tomorrow at a conference– I decided, why not kill it? I explored the options via my mobile app, and saw the link to deactivate the account. 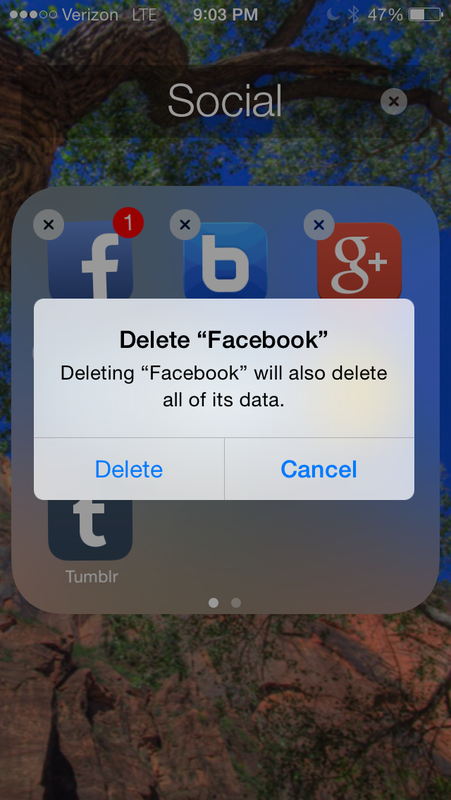 Then it was really nice to delete the app- I expect much better battery life. Alas, I was not done yet. So back in my room, I had to log on again. 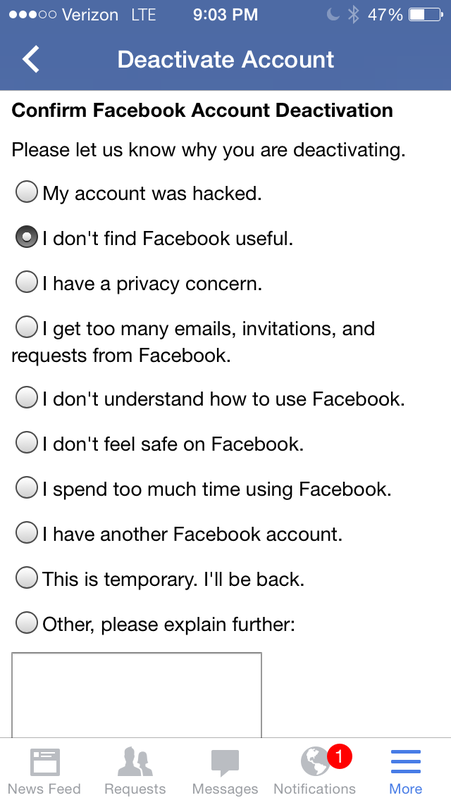 Just by doing that, Facebook right away re-activated my account. 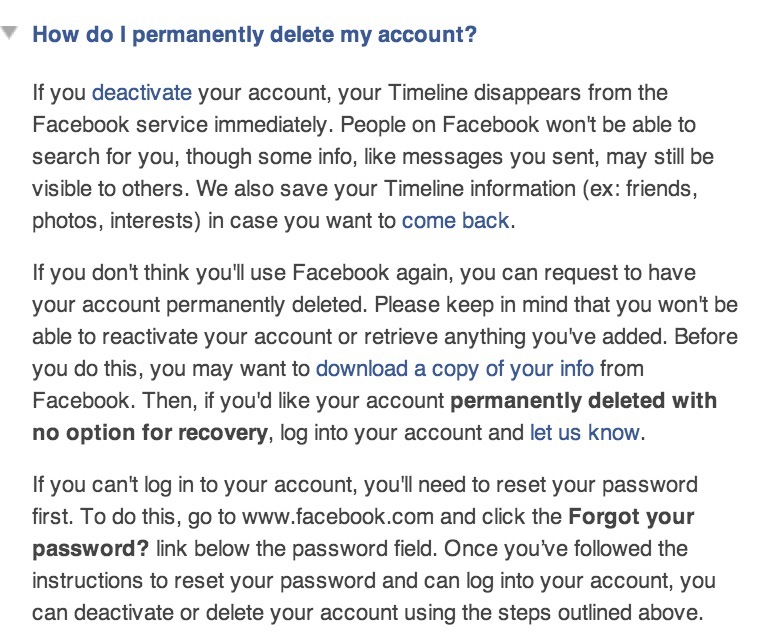 Let’s be clear- Facebook makes it really hard to delete an account, and you really have no confidence they did, but they will reinstate you faster than a gnat’s fart. 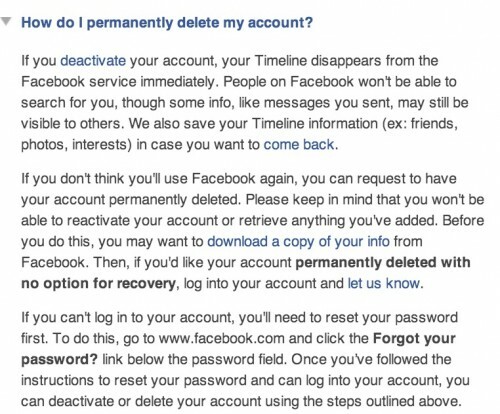 There is no link or button on your Facebook settings to delete your account. I had to search for it — for your reference, here is the direct URL https://www.facebook.com/help/delete_account. Note there is no hypertext that reads “delete my account” — it is “let us know”. Oh, look how nice they are, you can download your information! That might be a nice thing to know what they know. To download your data, you actually have to tell them to collect it? WTF? They have your data– just provide a direct link. No thanks. My facebook data has zero value to me. I got lucky, I figured it out on one try. But there is goes, right in the heart. Unless I am moronic enough to log in (doubtful). Regardless of their ethics, their every shifting privacy settings, their incessant hoarding of data… the very fact that Facebook makes it this freaking hard to leave tells me that there is something foul smelling in the basement and I don’t want anything to do with it. That how thing of “Everybody is there?” has no weight. There is bigger place, without restrictions on letting you exit– where everyone is. It’s called The Open Internet. Or even bigger, The World. 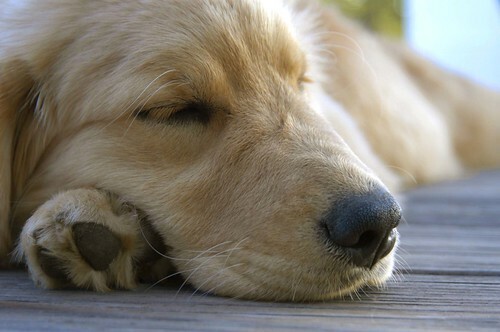 I feel rather at peace. Not a topic we see eye to eye on but always a pleasure to watch my favorite Web Slinger take a few whacks at the Resident Dragon. Ra ra ree! Kick em in the knee! Ra ra rass! Kick em in the other knee! We miss ya, Alan, come back. We’ll play better! 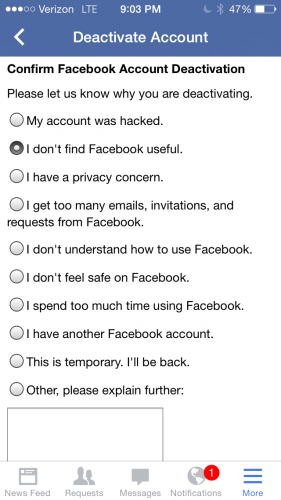 I have never used Facebook for professional purposes and agree with your assessment about unwanted noise. I am currently reviewing Klout and wondered about whether not being active in Facebook would impact my score. 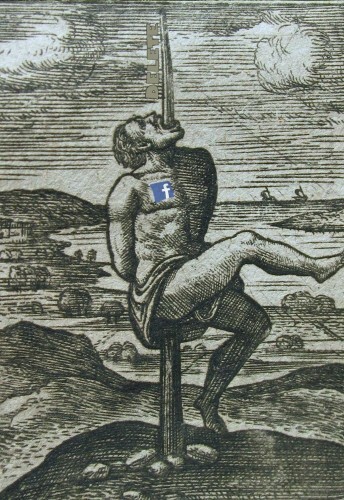 Thanks to your blog post, I have no worries about not including Facebook content in my influence analysis. No more ‘likes’ from the dog! Guess you’ll have to find out all the important stuff someplace else. 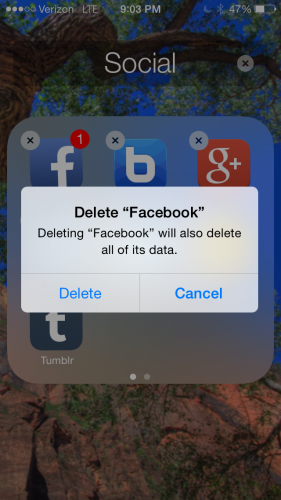 Your story about trying to obliterate Facebook reminds me of when I tried to close Mom’s email and got the hard sell because I just said I was her rather than go into the whole death thing. That was pretty funny, in a sad way. Cookielady is probably still out there!